Grasses, such as wheat, oats, and barley, whose embryo is called the “germ”. It’s stored food is mostly complex carbohydrates like starch. Legumes, such as peas, beans and lentils. Legumes contain a much higher level of protein than grasses. Oilseeds, such as sunflower, canola and safflower. 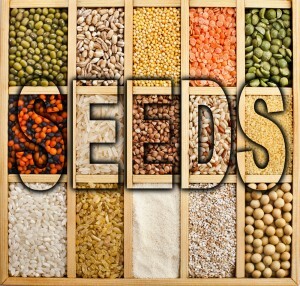 Oilseeds contain much higher levels of oils than grasses and legumes. Pomegranate seeds – These sweet-tart juicy seeds are filled with antioxidants, vitamins C and K, and minerals such as manganese, potassium, phosphorus, iron, calcium, and zinc. They also contain unsaturated oils, fiber and a bit of protein. These vitamins and minerals encourage skin cell regeneration, fight free radicals, and protect against sun damage. Pomegranates provide energy, have anti-inflammatory and anti-bacterial properties, and aid in protecting cardiovascular health by supporting healthy cholesterol levels. Pomegranate seeds aid digestion and elimination, help to cleanse the body, and facilitate healthy weight maintenance. Wheat germ – Because it is meant to feed a new plant, wheat germ is packed with nutrients, antioxidants and phytosterols. Wheat germ contains a good amount of fiber, which is necessary for normal blood sugar balance, cholesterol control, intestinal health and detoxification. Wheat germ also contains important B vitamins, such as folate, thiamine and B6, which support cardiovascular health and healthy brain chemical production. It is also a good source of omega-3 fatty acids, which help lower inflammation, support a healthy nervous system and protect against cardiovascular disease. Flax seeds – Flax seeds have been considered a powerful food source since ancient times. There’s evidence that the benefits of flax seeds include reducing the risks of heart disease, cancer, diabetes, and stroke. Flax seeds are a rich source of micronutrients, vitamin B1, manganese, omega-3 essential acids, lignans and both soluble and insoluble fiber. To get the most health benefits, these tiny, nutty-flavored seeds should be ground before consuming. Pumpkin seeds – These delicious seeds contain magnesium, which benefits blood pressure and may help prevent sudden cardiac arrest, and are a rich source of zinc, important for immunity, cell growth, insulin regulation and eye health. Pumpkin seeds are a good source of plant based omega-3 fatty acids and contain phytoestrogens, which aid good cholesterol and help relieve menopausal symptoms. Pumpkin seeds aid restful sleep as they contain tryptophan, which is needed for melatonin and serotonin production. Pumpkin seed oil has been found to have anti-inflammatory effects. Grape seeds – Grape seeds contain vitamin E, flavonoids, ALA omega-3’s, and the powerful antioxidants called oligomeric proanthocyanidin complexes (OPC’s). Grape seed extract has a wide range of therapeutic properties which aid wound healing, improve bone strength, support healthy blood vessels and blood pressure, and may prevent cognitive decline. Studies show that grape seed extract can relieve symptoms relating to chronic venous insufficiency, such as pain, swelling, and fatigue and may relieve swelling after surgery or injury. Sesame seeds – As one of the oldest condiments known to man, sesame seeds are highly valued for their oil. Sesame seeds are a very good source of manganese and copper and a good source of calcium, selenium, magnesium, iron, phosphorus, zinc, B complex vitamins, and dietary fiber. Sesame seeds contain lignans, which help maintain blood pressure and have been shown to have cholesterol lowering effects. These seeds are rich in mono-unsaturated fatty acids which help to prevent coronary artery disease and stroke by favoring healthy lipids. In summation, seeds contain notable health-benefiting nutrients, minerals, antioxidants and vitamins that are essential for wellness. Adding these nutritional powerhouses to your diet and eating healthier can be part of an alternative program against illness. Grape Seed Extract -V by Douglas Laboratories – This vegetarian capsule supplies 100 mg of standardized grape seed extract. Sesame Seed Oil Caps by Biotics Research – Each sesame seed oil capsule supplies 770 mg of sesame seed oil. Flax Seed Oil Capsules Organic Cold Pressed by Ortho Molecular – Each soft gel capsule contains 540 mg of Alpha Linolenic Acid, 150 mg of Linoleic Acid and 210 mg of Oleic Acid. This entry was posted in Home and tagged Professional Supplement Center, seeds, Vitamins and supplements, www.professionalsupplementcenter.com. Bookmark the permalink.